You come to us for snacking suggestions all the time. With this special subscription, let us go ahead and send our favorites straight to you, one month at a time. 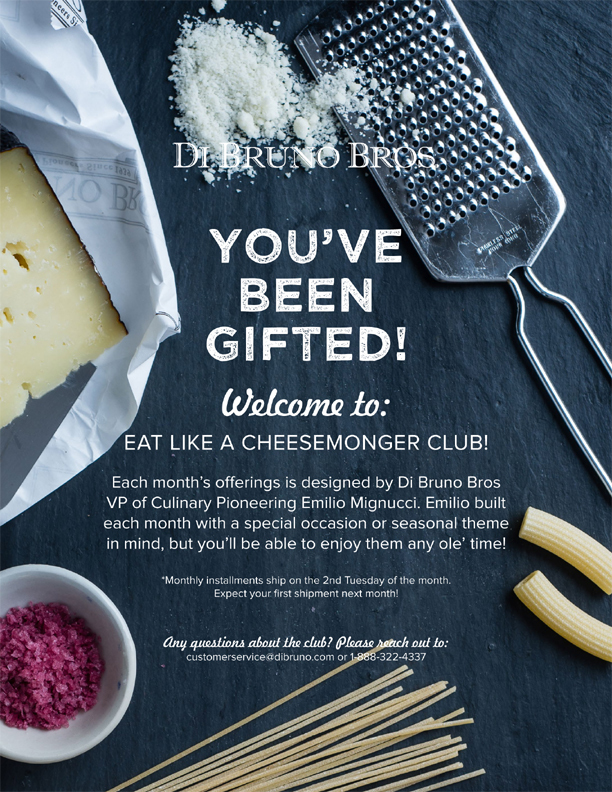 Each month's offerings is designed by Di Bruno Bros. VP of Culinary Pioneering Emilio Mignucci. He's blazed a path of discovery and deliciousness over the years, and every meal he enjoys is a celebration of ingredient and flavor. Emilio built each month with a special occasion or seasonal theme in mind, but you'll be able to enjoy them any ole' time. After all, isn’t great food always worthy of celebration? Pairings ship on the 2nd week of the following month and shipping is included, so just kick back and wait for discovery to come your way! So how do you eat like a cheesemonger? Emilio Mignucci is a third generation owner at Di Bruno Bros. and serves as our Vice President of Culinary Pioneering. He’s always on the quest for the latest and greatest eats, and loves telling the stories behind them. Read more about Emilio here. With this club, we’re making it easy for you to eat like Emilio. Every day, he looks around the stores and thinks about what he wants to take home and enjoy himself before also passing along ideas to guests in our stores. With that “I love these products” mentality in mind, he’s designed this club of monthly baskets to share his favorite of the favorites, themed out for the particular month in which you’ll be receiving them. One cool-weather shipment may include caviar, luscious cheese, foie medallions and rainforest crisps. Another could be spaghetti-centric, starring squid ink spaghetti, colatura anchovy extract, pecorino and crunchy capers. When Spring comes around, you’ll see fresh cheeses, fruit compotes and accentuating oils. This part is for us to know, and for you to be excited to find out. We’ll confidently say that these are some of the more special offerings that you’ll find in our shops. Join the club and look forward to a special occasion, every month, delivered right to your doorstep.